Dental implants are a surgical fixture placed into the jawbone and allowed to fuse over time. The purpose of the implant is to replace the root of the missing tooth and to hold a replacement tooth or bridge of replacement teeth. 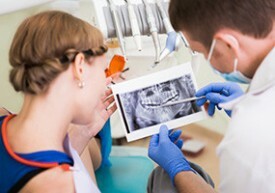 Short of natural tooth, a dental implant is one of the most stable and long-lasting pieces of technology a person can have to help maintain a more youthful and healthy oral appearance, to allow them to eat properly, and to minimize jawbone loss and other medical problems that come along with not having your teeth. Like most “recent” medical procedures, dental implants are not quite as recent an invention as we might think they are. In fact, the earliest attempts at dental implants can be traced back to the Mayan civilization in about 600 A.D. Archeologists have recovered ancient skulls which contained teeth that had been replaced with materials such as carved stone, seashells and even jade! Despite their primitive dental methods, some of these dental implants did manage to fuse to the jawbone. In recent history, the discovery of what makes dental implants work happened almost by accident. In 1952, an orthopedic surgeon in Sweden named Per-Ingvar Branemark tried inserting small titanium cylinders into bone to study how bone healed. During one of his attempts to remove the titanium cylinders, he noted that the titanium had fused to the bone and called this “osseointegration” (osseo meaning bone and integration meaning to fuse or join with). This property of osseointegration is the biological foundation on which dental implant technology is built. After this discovery, dental implants were introduced for use with patients who had lost all of their teeth and could not properly stabilize or tolerate dentures. Typically this difficulty was rooted in how much of the jawbone had been lost to disease or defect, so the dentures had nothing to rest on. Nowadays, most implants are used to replace single teeth or multiple missing teeth, though they can be successfully used to create replacement units for patients who are missing all of their teeth. In the past, implants were all made at the same width and were machines smooth and polished. Now, the implant posts come in a variety of shapes and sizes to suit the different needs for the teeth they need to replace. Also, the surfaces of the posts are no longer machined to a smooth finish. Instead, they are roughened in order to create nicks and scratches in the metal that increase the surface area that bone can attach to. If you are curious if you might be a candidate for dental implants, make an appointment for a consultation! We would be happy to get you started on your path to better dental health!